The moment you step through the stone wall on the cobble-stone street into our front garden you are enveloped in Colonial Antigua. Private, gated and guarded, this small enclave of homes is quiet, shaded and regal. All rooms are appointed with period antiques and artifacts. Expansive gardens are viewable from every room. Our home comes with the comfort and convenience of all modern amenities without interfering with the feel of the era. A detached bungalow with a bedroom, bath and living room includes a TV, refrigerator and microwave oven. Guatemala has been for me and my family our second home. The people, climate, surroundings, and its culture has always fascinated us, and we want to share this with you now. All of the rooms include a bathroom. We just upgraded the internet speed from 5GB to 30GB. Only bathroom towels are available, bring your pool towels. There is enough silverware, dishes, and glasses for 12 people. The dining room has a table for 8. Amazing home! The space was perfect for a family of 12. The pool was a plus for the kids and the master bedroom has views that will take your breath away. The home is kept cleaned and fresh. Our family had an amazing time and the drive to the main town is a simple Five or less minute drive. We didn’t use the lady but they have house keeper she cooks and washes. Great!! Hope to see you soon!! Thank you for sharing your lovely home in Antigua. Just the grounds and the house itself was a vacation. Our family ages range from 60 to 6, and everyone had just what they needed to enjoy a first time vacation to Guatemala (except a blowdryer, pack one if you can). The guard gate, house, and yard workers were very friendly. We felt very safe at all times. We were just a few minutes away from wonderful restaurants, shopping, and entertainment. When we return, we will not want to stay anywhere else but here. Thank you! I am very happy that all of your family enjoyed the house! We will be more than happy tonwelcome you back!! Quiet location, beautiful gated upscale residential area, gorgeous gardens, spacious rooms in gracious colonial-style villa with casita to match. In addition to the pool and lush landscaping, there’s a covered area with a fireplace and gas BBQ. Also, 2 of the bedrooms and 3 of the gathering areas in the main house had fireplaces. I mention this because we were there in January and this house was designed with keeping it cool in mind. It was cold even though the forecasted temperatures were in the mid-70’s (which only lasted for a few hours in mid-day.). Winter Advice: Take warm robe and slippers, plus more than one sweater or other warm wrap for mornings and evenings. BTW No hair dryers provided. The house manager, Miguel, is very helpful and easy to reach. The mother-daughter team of housekeepers helped make our stay very pleasant and comfortable. Transportation to the Main Square, etc. : TUC TUCs, taxi’s and the “Chicken” bus. Also, walking, but all forms require some fortitude. Each is a bit of an adventure. For the many cobblestone streets in old town we recommend comfortable thick soled shoes. Ask Miguel for restaurant and local tour suggestions...too many good ones to list here! We were 7 adults who loved this haven to return to after our various daytime excursions and mini-adventures! Some of us preferred relaxing at the property to more sightseeing, now and then. We were free to come and go as we pleased! The perfect vacation!! It was a wonderful and magical experience! We had an amazing time staying at this house. It is is only a quick 15 minute walk into town and the views are just beautiful from the gardens as well as the balcony. The housekeeper and her daughter, while not speaking any English, are just lovely. Our daughter is adopted from Guatemala so she did enjoy practicing her Spanish talking to the housekeeper's daughter. We did ask the housekeeper about preparing a traditional meal for us one night which she did for a very reasonable rate plus the cost of the groceries. Miguel and Mario did arrange a driver to pick us up from the airport who on the way to the house stopped at a great grocery store so we could start with a few groceries. This was most helpful as we were exhausted and trying to find the grocery store downtown seemed a bit daunting when we had just arrived. There is a little market and 2 great restaurants that are just a 5 minute walk from the house - Joe's Grill and Di Napoli which made it nice that first night. All in all, great trip and great place to stay. A spectacular home! A must stay! If you are looking for a large, beautiful, comfortable home for your friends or family right outside of Antigua, stop here. This was probably the most beautiful home away from home we have ever rented. We were a family of 11, including young children, parents, and grandparents, and we all just fell in love with the house from the moment we arrived. The art work in the home--photography by the owner, a professional, ceramics by Guatemalan artists, wonderful old and new craft pieces--surrounded us with Guatemalan life and beauty, yet our children/grandchildren felt free to roam, taking care but never having to "tip toe" around the art. The adults could easily walk to the center of Antigua, and the kids rode the 10 minutes with other adults in tuk tuks or cabs. Antigua itself is a very special old town, fun for shopping and great eating, and lots of walking. We hired a local cook for some dinners, and bought food for our breakfast. The house and garden staff are wonderful and helpful. Weather was perfect every day, not too hot, but still warm enough for the dip in the pool and hot tub were ideal by the end of the afternoon. 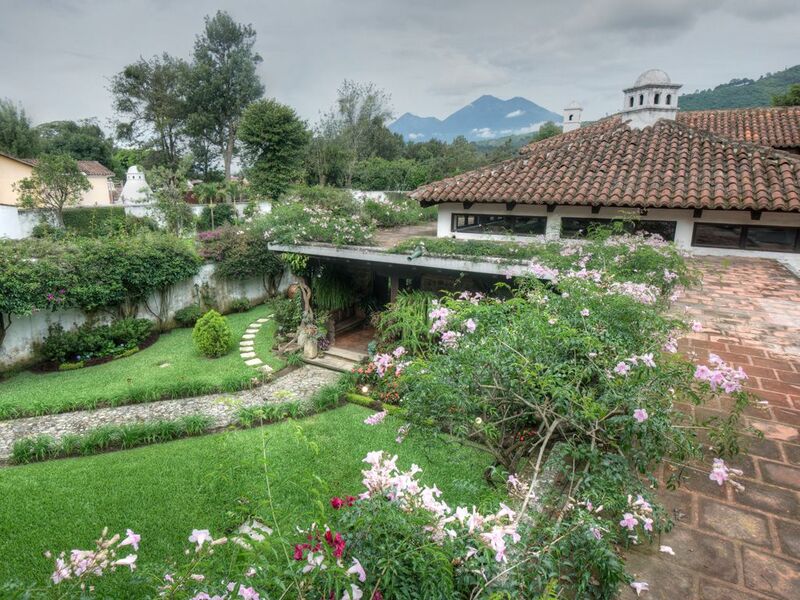 In short, if you are considering Guatemala for vacation, go to Antigua and rent this fabulous villa! Thank you for such a wonderfull review. !!! You and your family left a good impression with the house staff, i appreciate your kindness!!! Antigua Guatemala is a Unesco World Heritage Site. Founded on March 10, 1543 the Spanish conquistadors founded present-day Antigua, and again, it was named Santiago de los Caballeros. For more than 200 years it served as the seat of the military governor of the Spanish colony of Guatemala, a large region that included almost all of present-day Central America and the southernmost State of Mexico: Chiapas. In 1566 King Felipe II of Spain gave it the title of 'Muy Noble y Muy Leal' ('Very Noble and Very Loyal'). With its cobblestone streets, colonial churches, and many restaurants to choose from, Antigua Guatemala will enchant all of your senses. The house Fits 12 people max. If more people stay in the house, an added $35.00 per person will be charged for every night the extra person stays in the house. The rate go as follows...From 1 to 12 $389.00 a night, for holidays the rate is $449.00 from 1 to 12 people.